In June 2004, at the recommendation of President George W. Bush, the U.S. Treasury Department instituted restrictions on academic travel to Cuba. These restrictions established additional travel regulations, limited specific licenses for educational activities, and eliminated educational exchanges sponsored by secondary schools. These constraints forced many academic institutions to end their Cuba study abroad programs, resulting in a 92% decrease in the number of U.S. students studying in Cuba. 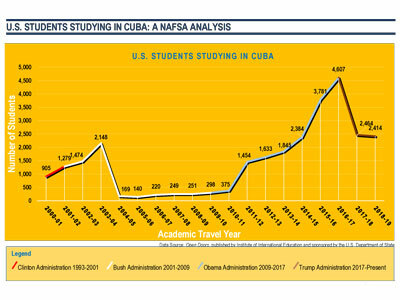 In January 2011, in a major advocacy victory for NAFSA, the academic exchange community, and the larger coalition advocating for normalized relations with Cuba, President Barack Obama announced new regulations to lift restrictions on academic travel to Cuba. The changes allowed for eased engagement in academic and other types of people-to-people travel and allowed all Americans to send remittances to Cuba. These welcomed changes resulted in a 300% increase in the number of students studying in Cuba from 375 in 2010-11 to 1,454 in 2011-12. Despite this impressive increase, study abroad programs have still not fully recovered from the 2004 changes. In December 2014, the Obama Administration announced a series of historic economic and diplomatic policy changes to begin to normalize relations with Cuba. These sweeping changes broaden the categories of acceptable travel to Cuba licensed by the U.S. Treasury Department. Any administration, however, can only ease travel restrictions within the current statutory framework. NAFSA urges Congress to do its part in normalizing relations with Cuba by ending the travel ban and lifting the trade embargo so that Americans can engage freely and constructively with Cuba and its people. Travel is inherently educational and is a human right. It is time to end the U.S. embargo on Cuba.